Rowena Dickins Morrison comments on the 6th session of the Expert Mechanism on the Rights of Indigenous Peoples (8–12 July 2013, Geneva). The Expert Mechanism on the Rights of Indigenous Peoples (EMRIP) held its sixth annual session from 8 to 12 July 2013 at the United Nations (UN) Office in Geneva (1). EMRIP was created by the UN Human Rights Council (HRC) in December 2007, following the adoption in September of that year of the United Nations Declaration on the Rights of Indigenous Peoples (UNDRIP) by the UN General Assembly. HRC Resolution 6/36 thus establishes EMRIP as a subsidiary expert mechanism with a mandate to provide the HRC with thematic expertise on the rights of Indigenous Peoples through studies and research-based advice, on the request of the Council, and through suggesting proposals to the HRC, within the scope of EMRIP’s work as set out by the Council. EMRIP is constituted by five independent experts holding three-year terms, with the possibility of renewal for an additional term. Significantly, four of the five current EMRIP experts are indigenous, although the terms of two of those four indigenous experts will expire in 2014 and their replacements are as yet unknown (2). EMRIP holds annual meetings that are open to the participation, as observers, of a broad range of stakeholders, including : representatives of Indigenous Peoples’ organizations and NGOs ; States ; UN mechanisms, bodies and specialized agencies, funds and programmes ; intergovernmental organizations ; regional and national human rights bodies ; academics and experts on Indigenous Peoples ; and NGOs with ECOSOC (3) consultative status. Both State and indigenous representation at EMRIP’s sixth session was strong. In addition to the five EMRIP experts, the meeting’s proceedings also benefited from the presence and input of James Anaya, UN Special Rapporteur on the Rights of Indigenous Peoples (SR), Paul Kanyinke Sena, Chairperson of the UN Permanent Forum on Indigenous Issues (PFII), José Francisco Cali Tzay, Vice-Chairperson of the UN Committee on the Elimination of Racial Discrimination (present at EMRIP in his personal capacity), Joenia Batista de Carvalho, Member of the Board of Trustees of the UN Voluntary Fund for Indigenous Populations, Rafendi Djamin, Representative of Indonesia to the ASEAN Intergovernmental Commission on Human Rights, and Mick Gooda, Australian Human Rights Commission’s Aboriginal and Torres Strait Islander Social Justice Commissioner. The five-day meeting’s agenda included discussion of the upcoming World Conference on Indigenous Peoples, follow-up to EMRIP’s previous thematic studies and advice, the current EMRIP thematic study on access to justice in the promotion and protection of the rights of Indigenous Peoples (to be presented to the HRC at its 24th session in September 2013), and UNDRIP. EMRIP’s sixth session was the first major international gathering of indigenous and State representatives to be held subsequent to the Alta Global Indigenous Preparatory Conference for the 2014 high-level plenary meeting of the UN General Assembly, known as the World Conference on Indigenous Peoples (WCIP). The Alta Conference, hosted by the Sami Parliament of Norway from 10 to 12 June 2013, represents the culmination of the indigenous preparations for the WCIP to date. These preparations have included notably the formation and work of the indigenous Global Coordinating Group (GCG), the work of the indigenous co-facilitator for the WCIP appointed in April 2012 alongside a State co-facilitator by the President of the General Assembly to conduct inclusive informal consultations on his behalf, and the preparatory meetings on the WCIP held by each of the seven indigenous regions and two indigenous caucuses (4) between October 2012 and April 2013. The primary goal of the Alta Conference was for indigenous representatives from the seven regions and two caucuses to adopt a collective position on the WCIP, so as to be able to effectively lobby States to adopt the collective indigenous proposals for both the themes to be treated during the WCIP and the recommendations to be included in the ‘concise, action-oriented outcome document’ that will constitute the most significant outcome of the WCIP (5). Through the hard work and dedication of all of the indigenous representatives involved, the goal of the Alta Conference was achieved with the adoption of the Alta Outcome Document. References to the WCIP were frequently made throughout EMRIP’s sixth session. Furthermore, the WCIP was the first substantive item to be treated on the agenda. The three UN mechanisms devoted to Indigenous Peoples and their rights (EMRIP, SR, PFII) expressed their support for the Alta Outcome Document and emphasized its importance for the WCIP process and beyond. EMRIP released a conference room paper consisting of a work-in-progress compilation of recommendations, conclusions and advice from EMRIP studies that correspond to and support different sections of the Alta Outcome Document (see A/HRC/EMRIP/2013/CRP 1). The Alta Outcome Document was itself given the status of an official UN document, being introduced by EMRIP as the second conference room paper for the session (A/HRC/EMRIP/2013/CRP 2). This was considered important by a number of EMRIP experts and indigenous representatives, who viewed it as a first step towards raising State awareness of and support for the collective indigenous position articulated in the Alta Outcome Document. These kinds of circular plays of legitimation between indigenous representatives and the international system (especially the indigenous-specialist UN mechanisms, which still tend to be marginalized within that system) were also particularly apparent in the intervention of the SR on the WCIP (6). James Anaya noted the involvement of the three indigenous-focused UN mechanisms in the indigenous preparatory process to date, including the Alta Conference. He strongly affirmed the significance of the Alta Outcome Document, not only in terms of the organization of the WCIP, but also as ‘an important normative and programmatic instrument and plan of action in its own right’, regardless of the outcome of the WCIP (7). In this connection, Anaya stressed the Alta Outcome Document’s high level of legitimacy, stemming from its mode of production and adoption, involving a lengthy and extensive global indigenous process. Moreover, Anaya identified a large degree of congruence between the focus of his prior and current work and the priorities of Indigenous Peoples expressed in the Alta Outcome Document, and affirmed that the work of the SR, EMRIP and the PFII should be guided by it into the future. During the half-day discussion of this agenda item, the statements made by State representatives were similarly designed to bolster those States’ claims to legitimacy, both internationally and domestically, through expressions of broad support for the WCIP process, including indigenous participation therein, and for EMRIP’s continuing work (and that of the SR and the PFII) in this connection. At one end of the spectrum, Mexico affirmed that the Alta Outcome Document, including particularly its four major themes, should guide and form the basis of reflection on not only the upcoming regional and thematic meeting on the WCIP to be hosted by Mexico in early 2014, but also the WCIP itself and its action-oriented final outcome document. At the other end of the spectrum, the CANZUS States (8), all of which made statements on this agenda item, were more circumspect regarding the Alta Outcome Document, while nevertheless reaffirming their support for the WCIP and indigenous participation therein (qualified restrictively by the USA as ‘appropriate and broad participation’) (9). Canada, Australia and New Zealand all acknowledged the Alta Outcome Document and stated that they would consider and review its recommendations closely. In contrast, the United States did not refer to the Alta Outcome Document in its intervention. Rather, the USA affirmed that the themes of the interactive round-table discussions of the WCIP are ‘to be decided by the General Assembly in accordance with Resolution 66/296’, and gave some indication as to possible themes that were different to (if overlapping with) those advanced in the Alta Outcome Document (10). With very few exceptions, indigenous representatives expressed their support for the Alta Outcome Document. They also called for its adoption by States in defining the WCIP process into the future, including particularly its final, action-oriented outcome document. The affirmation in the Alta Outcome Document’s preamble that ‘nothing in this [the WCIP] process or its outcomes may be interpreted as diminishing or eliminating any of the rights of Indigenous Peoples’, was strongly reiterated, particularly in light of the comments made by the United States during the PFII’s twelfth session that ‘self-determination, as expressed in the Declaration [UNDRIP], is different from self-determination in international law’ (11). Calls were made by numerous indigenous representatives for more State funding and technical support for continuing indigenous preparations and participation in the WCIP process. Many of the positions articulated by indigenous representatives were reflected in Proposal 2 adopted by EMRIP on the WCIP at the end of its sixth session, which includes proposals to the HRC that : the themes identified in the Alta Outcome Document be considered as the themes for the WCIP ; the HRC support the consideration of the Alta Outcome Document in the drafting of the WCIP outcome document ; the HRC recommend to the President of the sixty-eighth session of the General Assembly the continuation of the practice of appointing both a State and an indigenous co-facilitator for the WCIP ; and that the HRC support and urge States to provide increased financial, technical and political support for the participation of Indigenous Peoples in the preparations for and at the WCIP (12). 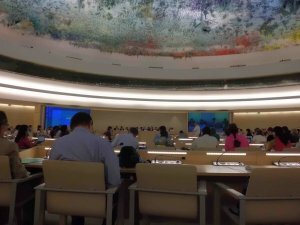 Another recurring theme throughout EMRIP’s sixth session was the limitations of the UN system’s current recognition and protection of Indigenous Peoples and their rights. This subject has been frequently raised in past sessions of both the PFII and EMRIP. Unsurprisingly, it was also selected by indigenous representatives as one of the four major themes elaborated in the Alta Outcome Document for the WCIP – ‘Theme 2 : United Nations system action for the implementation of the rights of Indigenous Peoples’. Particularly during discussion of agenda item 6, UNDRIP, which included a panel followed by an interactive dialogue (breaking from the routine delivery of pre-prepared interventions in succession), indigenous representatives continued their calls for more effective international review and redress mechanisms in relation to State implementation and State violations of UNDRIP and indigenous rights more broadly. EMRIP, the SR and the PFII all frankly acknowledged the great challenges in this area and the current limitations of their mandates and the UN system. The three mechanisms discussed the implications and scope of UNDRIP article 42, emphasizing the need to push their respective mandates further in following up on UNDRIP’s effectiveness and the promotion of respect for and full application of its provisions by States and the UN. The final report on EMRIP’s sixth session includes a proposal to have UNDRIP explicitly included in the list of standards on which the existing HRC’s Universal Periodic Review process is based (this also features as a recommendation in the Alta Outcome Document), as well as a proposal for States to establish, with indigenous participation, independent mechanisms to oversee and promote implementation of UNDRIP and the recommendations made by UN bodies and mechanisms relating to indigenous rights. In this panel discussion on UNDRIP, both the SR and the PFII Chairperson indicated a persisting lack of awareness within the UN system of indigenous rights and the consequent failure by many UN actors to consistently consider and effectively promote the implementation of those rights. Anaya thus affirmed the need to ‘mainstream’ UNDRIP within the UN system itself (13). This discussion of the application of UNDRIP within and by the UN system resonated with the numerous statements made by indigenous representatives throughout EMRIP’s sixth session highlighting the hypocrisy of the international system in relation to indigenous rights. Despite the adoption by the General Assembly of UNDRIP in 2007, the systemic marginalization of indigenous representatives and participation in the UN has remained, in contravention of the now internationally recognized rights of Indigenous Peoples to self-determination and to participate in decision-making in matters affecting them through their own representatives (see particularly UNDRIP articles 3, 18 and 42). In its final report, EMRIP consequently reiterates its previous proposal (from its fourth session, which was also echoed in a recommendation in the Alta Outcome Document) that the General Assembly adopt appropriate permanent measures to ensure that Indigenous Peoples’ governance bodies and institutions are able to participate at the UN as observers with, at a minimum, the same participatory rights as NGOs with ECOSOC consultative status. Moreover, EMRIP also proposes a review of language used in UN documents to ensure consistency with UNDRIP (14). One proposal made by an EMRIP expert during the sixth session which was not included in the proposals adopted in the final report was the call made by Albert Deterville for the HRC to allow Indigenous Peoples and Nations to display their names during EMRIP’s future sessions in a manner similar to States, as a means of restoring and respecting the dignity of Indigenous Peoples. Another topic that sparked debate was raised during the panel and interactive dialogue on UNDRIP by the State representative for Indonesia, who noted that the participants of EMRIP meetings rarely refer to UNDRIP article 46, despite the fact that UNDRIP needs to be considered and construed in a holistic manner and despite the importance of article 46 for States, both during the negotiation of UNDRIP and subsequent to its adoption, given its clear recognition that UNDRIP rights remain subordinate to the UN Charter and to the territorial integrity and political unity of sovereign and independent States (15). The SR stressed the character of UNDRIP as a ‘remedial instrument’, and an ‘instrument of peace and reconciliation, not of destabilization’. Indeed, Anaya argued that article 46 should not be viewed as a counterpoint or limitation to UNDRIP rights, but rather as providing the context for the full realization of those rights : the existing framework of States. The SR thus concluded that the implementation of UNDRIP can only strengthen State sovereignty and stability, whereas destabilization and the undermining of State sovereignty come when indigenous rights are not respected. The majority of the other members on this panel (including EMRIP expert Jannie Lasimbang, Paul Kanyinke Sena, José Francisco Cali Tzay and Rafendi Djamin) concurred with the view expressed by the SR.
at certain points of the debates and negotiations, it was becoming […] not a UN Declaration on the rights of Indigenous Peoples, but a UN Declaration on the rights of States. So it was very difficult, at least […] for my delegation, to accept that article  in there, because the whole rest of the UN system is about the territorial integrity of states. What about territorial integrity of Indigenous Peoples ? This exclamation was met with vigorous applause in the room. Nevertheless, Littlechild went on to note that certain other elements (such as paragraphs 16 and 17 of the Preamble) were then included in UNDRIP in an effort to create a more balanced framework, from which ‘we could go forward and seek […] healing and reconciliation’. Unfortunately, we are all too aware that a lot remains to be achieved in order to guarantee the full enjoyment of the human rights of Indigenous Peoples […]. However, I would like to recall that the purpose of the discussion is not to list violations or to monitor the implementation of the Declaration. Rather, the aims [sic] of this discussion is to identify positive practices and challenges to improve the implementation of the Declaration […]. Similarly, in their lunchtime side event entitled ‘How to participate effectively in the Expert Mechanism on the Rights of Indigenous Peoples’, doCip and the UN Voluntary Fund for Indigenous Populations stressed that EMRIP cannot receive or pass on complaints or denunciations, or develop new standards, address situations by country or monitor the implementation of UNDRIP. The interventions made by State representatives generally complied with these prescriptions, in most cases affirming the commitment and presenting the work of the State in relation to Indigenous Peoples and their rights domestically and/or internationally in a very positive light, if often also vaguely acknowledging the persisting challenges to be addressed. In contrast, indigenous representatives’ interventions regularly denounced specific rights violations by particular States. This was especially pronounced in the indigenous interventions addressing agenda item 5, EMRIP’s current study on access to justice in the promotion and protection of the rights of Indigenous Peoples. These interventions often went so far as to denounce individual cases of wrongful imprisonment of indigenous activists and other rights violations relating to access to justice. At one point, the State representative for Algeria refuted the ‘unfounded allegations’ made by Algerian ‘civil society’ groups during the session, and expressed their regret that EMRIP’s meeting was being used to ‘unjustly’ raise individual cases and to make ‘unfounded’ comments regarding their country, and having nothing to do with the objectives of the meeting. The State representative spoke in this connection of the risk of the ‘diversion’ of EMRIP from its calling as a forum for the promotion of UNDRIP, to being a source of disharmony within populations and societies, and harmful to the national cohesion of States. Regardless of these comments and the limitations of EMRIP’s mandate, all of the accredited representatives who followed the established procedures to have their names inscribed on the list of speakers under the various agenda items were allowed to speak freely during the session, until their allotted time had expired. This aspect of EMRIP’s annual meetings might consequently be seen to mirror, in very small part, the public testimony and witnessing functions of the kinds of truth and reconciliation processes discussed in EMRIP’s most recent study on access to justice, thereby also recalling Anaya’s characterization of UNDRIP as an instrument of peace and reconciliation. Nevertheless, in the majority of instances, State and indigenous interventions routinely followed their parallel paths uninterrupted, often at cross-purposes. The treatment of the different agenda items consequently often gave the impression of an unbroken so-called ‘dialogue de sourds’ (‘dialogue of the deaf’), with perhaps one of the most flagrant examples being the affirmation by Vietnam that its country has no Indigenous Peoples, despite the participation of indigenous representatives from Vietnam in this same EMRIP session (16). It is also worth noting the reflection of the limitations of EMRIP’s mandate in the formulation of its questionnaire seeking the views of States and Indigenous Peoples on best practices regarding possible appropriate measures and implementation strategies to attain UNDRIP’s goals. Nevertheless, EMRIP’s final summary of responses to the questionnaire, presented and discussed during the sixth session, does interrogate and directly confront State and indigenous responses, thereby avoiding simply replicating the ‘dialogue de sourds’ which generally characterized EMRIP’s annual meeting. Throughout the sixth session, EMRIP’s experts particularly stressed the importance of EMRIP’s role in the WCIP process at all stages from this point onwards. They highlighted on several occasions that EMRIP’s seventh session is likely to be the last major international gathering attended by representatives of States, Indigenous Peoples, UN mechanisms and other stakeholders to take place before the WCIP itself, thereby offering one of the last opportunities to influence the WCIP and its outcomes. General consensus emerged during the sixth session on the major significance of access to justice in the promotion and protection of the rights of Indigenous Peoples. In keeping with the position articulated by the Global Indigenous Peoples Caucus that EMRIP should extend its study on access to justice for a further year, adding a focus on conflict resolution and peace (17), EMRIP’s experts adopted a proposal to the HRC that it authorizes EMRIP to continue its study on access to justice, ‘with a focus on restorative justice and indigenous juridical systems, particularly as they relate to achieving peace and reconciliation’ (Proposal 1). This proposal also states that the study ‘will include an examination of access to justice related to Indigenous women, children and youth and persons with disabilities.’ This attention to the special issues facing these groups was already apparent in EMRIP’s initial study and advice on access to justice, and in the panel discussion held on this agenda item during the sixth session. It confirms the broader trend of increasing awareness of the particular issues and challenges faced by indigenous women, children, youth and persons with disabilities, and the increasing recognition and inclusion of indigenous representatives of these groups in the international arena (exemplified by the creation of the ‘thematic’ indigenous Women, Youth and Disability Caucuses). EMRIP’s sixth session concluded on a sad note for many participants, given that the terms of Wilton Littlechild and Jannie Lasimbang as EMRIP experts, and the term of James Anaya as SR, will come to an end in April 2014. This highlighted the need for Indigenous Peoples to identify and lobby in favor of their preferred candidates for these positions. Many heartfelt expressions of thanks for the work of these three individuals were articulated by indigenous and State representatives alike. At the close of EMRIP’s sixth session, James Anaya received a standing ovation.